I think, in the midst of all the new brands each carrying one promise or another, causing frenzies and out-of-stock frustration, we have gravitated away from what is classic. And familiar. We have forgotten about The Body Shop. Well, at least I have. How can we forget the place that introduced us to the death-beige-lipstick and just-had-beetroot-red (aka 01 and 02)? The days when it was one of the few places in Bahrain that stocked good shampoos and showergels (back to the Sheraton days). Every birthday gift was a Body Shop basket filled with goodies and those little bath balls that were never used. Disclaimer: If you were born in the 90s and beyond you will not relate to this. So if The Body Shop has been around for this long, and keeps introducing new lines and renovating its product line, aaand it is actively helping the planet by supporting fair trade, against animal testing, and supports other important causes like HIV, reforestation, supports impoverished countries...etc, I figured: why not? It has to be that good. Since my birthday a few weeks ago and the undeniable fact that I aged one year, I thought it would be the perfect time to start looking for some treatments that, let's say, make me look younger. I know there are so many known brands out there but I am a true believer that a tube of serum should not cost you 20% of your salary for it work. I have nothing against the big brands but they many not necessarily be better than the more affordable ones - it just means that the bigger brands have a bigger advertising budget to match. SO it makes sense that their cost would be higher. Sorry Chanel-moisturizer-that-feels-smells-works-just-as-well-as-Oil-of-Olay. I did a couple of reviews a while ago on the products I use (see here and here) and please note that the products I will share with you are just an addition to my beauty regime (unless otherwise stated). So let me share with you my current, umm, problems. Dull skin, pores, and dark under-eye circles. RIP 20s. I walked into the Seef shop a few days ago and was greeted by friendly staff who knew what they were talking about. I told them I have these issues and what do you recommend. For dull skin, the Vitamin C line promises to add radiance to your skin and is claimed to be their "famous Skin Reviver". 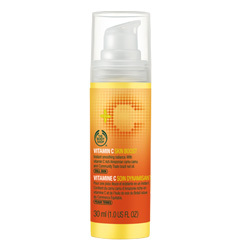 The Body Shop claims that it is the "antidote to dull skin". Vitamin C without a doubt is good for you in general - helps boost your immunity and are an excellent source of antioxidants (more on Vitamin C here). 1. Vitamin C Skin Boost for day. You apply it after your day moisturizer and before makeup. It has light-reflective particles that give you a nice subtle glow. It smells citrusy fresh and is applied pretty easily. My skin felt smooth and it didn't clog up my pores nor did it make my skin oily. This was BD 10. 2. 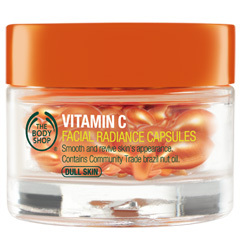 Vitamin C Radiance Capsules for night. They are basically 28 capsules that set you back around BD10.500 . You pop open one capsule and use it before your night cream. It is basically a course so you use it every day for 4 weeks. I am just 5 days into it and so far I don't see much difference yet. But it says 28 days so I will stick it out and judge when the jar is empty. Again, like the skin boost, it smells mildly citrusy and fresh and was easily applied all over my face and neck. For eyes, she suggested the Vitamin E line. Vitamin E is known to protect and repair skin. Most treatments that tackle scars and stretch marks contain Vitamin E (read about the benefits of Vitamin E here). 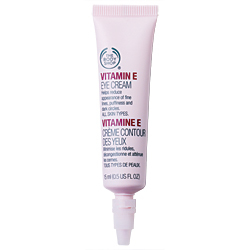 The Vitamin E eye cream hydrates, reduces the appearance of fine lines, and tackles dark circles and puffiness. It smells great and not overpowering, and a little dab goes a long way. What I like about it is that it is so airy it glides on smoothly and you don't have to push or tug to spread it under your eyes. My previous eye cream, the Kiehls Creamy Eye Treatment, is great, but I noticed that it only moisturizes and does not tackles my dark circles. I still have it and will use it every once in a while, but I have started using this one more regularly. The undereye cream cost BD5.500. For pores, the Tea Tree oil line was recommended. Tea tree is a popular natural remedy to treat acne, dryness, eczema, bug bite relief and can even reduce the duration of the cold (read about the benefits of Tea Tree here). 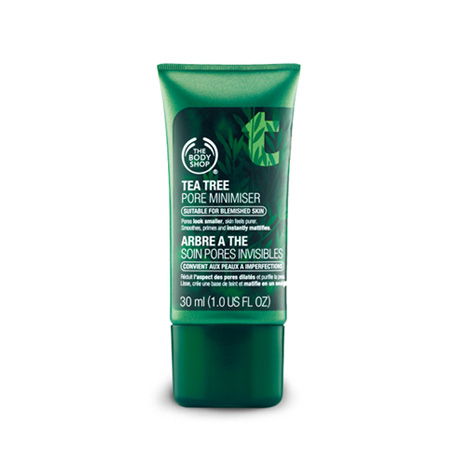 The Tea Tree Pore Minimizer promises to reduce the size and appearance of pores and mattifies the skin. You use it after your moisturizer and before your makeup. It smells herbal and I use a very tiny dot. I find it works really well with my makeup and it does make my pores smaller. This cost BD5.500. All four products cost me a total of BD31.500. The amount equivalent to one day cream. So far I am enjoying them and my skins feels and seems...happy. For the capsules it's too soon to tell but so far, five days into trying all these products out I have no regrets. Old is gold folks. And I am referring to The Body Shop, not my age. I'm Zain, and I'm from the beautiful island of Bahrain. I am an Integrative Nutrition Health Coach. This blog is an attempt to articulate the cacophony that is my mind. From reviews to recipes, projects to pictures, all within the sphere of my family, my kids, and my life. This is my world.